One of the most important parts of giving your home the right shine is doing a proper paint job. The fact is that it’s always easy to spot a difference between professional and amateur work. 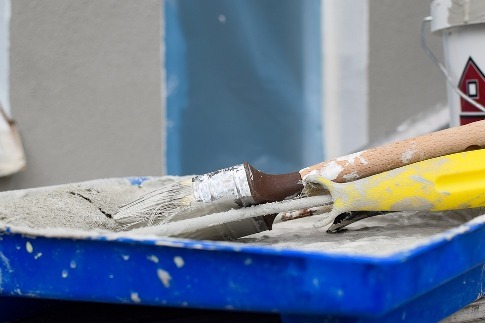 So, if you are attempting to take up painting as a DIY project, there are some tips that you need to follow in order for it to come up as close as it can to the work of a pro. In this article, we are going to discuss some of those tips, so that you don’t have to worry about a botched paint job. Using way too much paint on your brush is a mistake that you should avoid. It’s actually much better to put less paint on the brush or roller and then apply long and even strokes to create thin coats. It might seem like it would be easier to just use a lot of it with the hope that you will have to do only a single coat, but the fact is that the result simply won’t look good. Multiple thin coats are a better solution than one thick coat. After cutting the edges and the baseboard at the ceiling with a brush, it is time that you apply paint with your roller from top to bottom. People who don’t know what they are doing often finish the job with spatters and drips. If you want to do the job professionally, you will paint right over every mistake that you make by working your way with the roller down the wall. Remember that once a certain area begins to try, it is the best idea to no longer tamper with it. If you go back over it, you will leave color streaks and marks in the surface of the paint. Bed sheets aren’t a good idea for drop cloths. They are thin and paint will seep through to the flooring. While white plastic can contain spills, the fact remains that the paint will remain wet for way too long. It’ll get to your shoes, and spread around your house. According to the advice of professional Sydney painters, you should use canvas drop cloths. They absorb paint splatters and aren’t slippery. If you aren’t painting a ceiling, then all that you need is a canvas cloth that runs the length of the wall and is a few feet wide to protect your floor. What you surely want is a uniform color applied to both your home’s interior and exterior. In order to achieve this, you should mix multiple cans of the same paint color into a single big container. A five-gallon bucket will do nicely. This is a method called boxing the paint, and is also suggested by professionals. It’s an important solution for the situation when, for example, you buy a few gallons of paint, and then realize you need more, so you get more gallons later on. When painting sashes, you should forget about taping the windows. It takes too long, and paint most commonly ends up on the glass no matter how hard you try otherwise. What you should do is let it end up there, and let it dry. Afterwards, get a razor blade and scrape it off. You just need to be careful and not break the bond between the glass and the wood. If this happens, it can lead to moisture getting on the wood and resulting in rot. If you want to make your home shine, you need to do the paint job like a pro. In order to do this, just follow the tips in this article. If it’s a DIY project, it still doesn’t have to look like it was done by an amateur.